NEXT | What would you change about the Arathi Basin Comp Stomp Brawl? 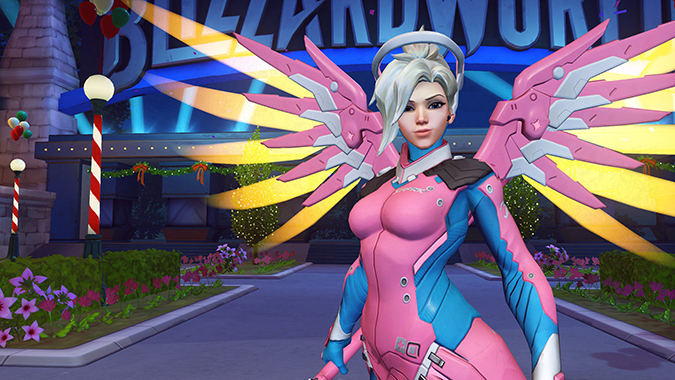 There’s a whole list of abilities that Mercy can increase the damage of in Overwatch. Some of them are less useful than others. Here are the abilities that you might not have known you can damage boost and ones which will do a lot for your team. One of the most important abilities to add that 30 percent damage increase to is Reinhardt’s Fire Strike. Why? Because it travels through barriers and deals considerable damage. Not only can you potentially eliminate some low-health targets or force them to back off and heal, you can greatly increase the amount of Ultimate charge your Reinhardt receives — which only gets him his incredible Earthshatter faster. Ashe’s Dynamite is another fantastic abilities to damage boost. It’s a damage-over-time ability that puts a ton of pressure on the enemy team, and it will get your Ashe a ton of Ultimate charge. I’ve been on the receiving end of the damage-boosted Dynamite, and it’s rough. With so many people suddenly on fire, it makes it almost impossible for healers to keep everyone alive. Genji’s Dragonblade has him using a sword and not his normal shuriken. It’s probably not too hard to understand that you can damage boost it, especially considering Ana’s Nano Boost Genjis — but it’s also a smart move if you’re Mercy. 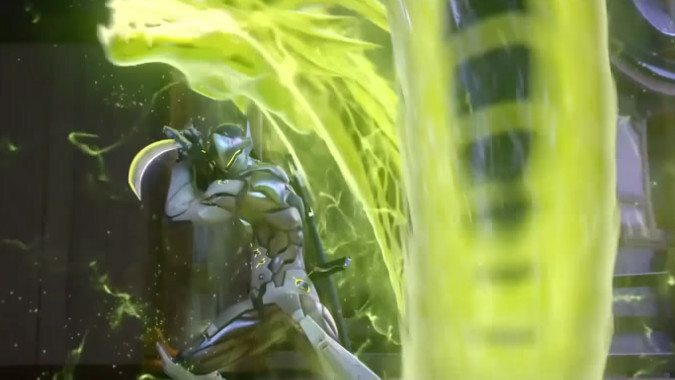 Basically, if you damage boost your Genji during his Ultimate, his sword attacks can kill most enemy heroes in one swipe plus a Swift Strike — and that means he can efficiently kill more targets. Better Genji players will know how to react to killing enemies faster and will likely do a lot more work with their Ultimate than they would have by themselves. McCree’s Ultimate Deadeye can be damage boosted too. Usually it locks onto enemies and closes a circle onto them as the potential damage increases. With a damage boost, the circles will close faster, making it less likely that your McCree will get killed while he’s standing there. Tracer’s Pulse Bomb is actually susceptible to damage boost, even though it might not seem like it. It’s not a very useful thing to damage boost unless your Tracer is tossing it into a Graviton Surge, but it doesn’t hurt if you have nothing else to do. It’s one of those leftover projectile-based Ultimates that can still be modified. While we’re here, it’s worth mentioning that turrets, like Torbjorn’s turret and Symmetra’s Sentry Turrets, can’t be damage boosted. Nor can stuff like Wrecking Ball’s Minefield. So, don’t let your teammate Torbjorn get mad at you for not linking your damage beam to him. As with any damage boosts in Overwatch, all of these work the same way with Ana’s Nano Boost and Orisa’s Supercharger Ultimates. They’re not as useful as a free, damage-boosting beam from Mercy, but they’re still applicable. It might sound like a small thing to try and damage boost certain things in a game, but even the tiniest advantages can determine the victor of a fight — or even the entire match.